If you’re looking for an affordable way to update your bathroom without the mess of a total remodel, here’s a suggestion. 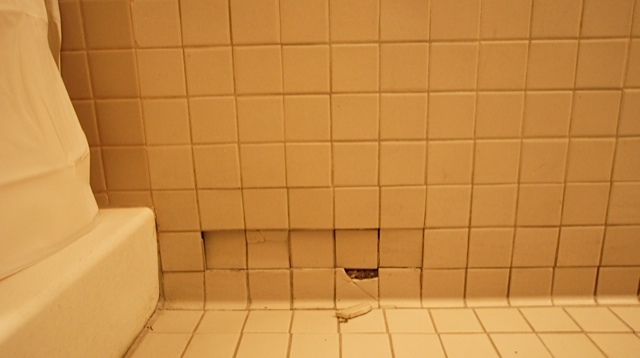 Consider refinishing your existing bathtub, tile and vanity surfaces instead. Surface refinishing is a great alternative to traditional remodeling and learning about it from Miracle Method is the best way to start. 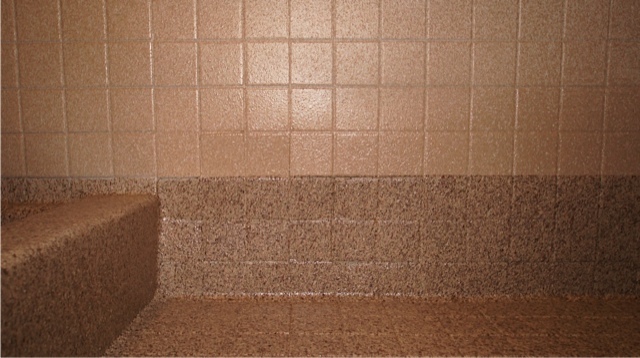 • We repair any surface damage and refinish the existing surface in your choice of colors and texture. • We extend the life of your fixtures for up to 15 years or until you want to change the color again. • The new finish looks and feels like new. Miracle Method has been making bathroom and kitchen surfaces look like new at savings of up to 75% of replacement costs for over 30-years. Try us now, and surprise yourself and friends with a fresh new look for Spring! 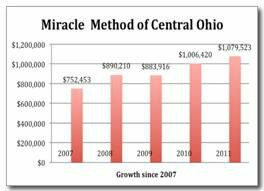 As we have previously mentioned, Miracle Method is a recession-resistant business opportunity that many of our franchise owners can attest to, including Leo and Emily Sayles, owners of Miracle Method of Central Ohio. Leo and Emily originally purchased a Surface Doctor franchise in 1999, and shortly thereafter, it was bought out by Miracle Method. “When Chuck Pistor, President of Miracle Method, presented us with the opportunity to switch to his growing franchise system from Surface Doctor, we knew it was an opportunity that we could not pass up. 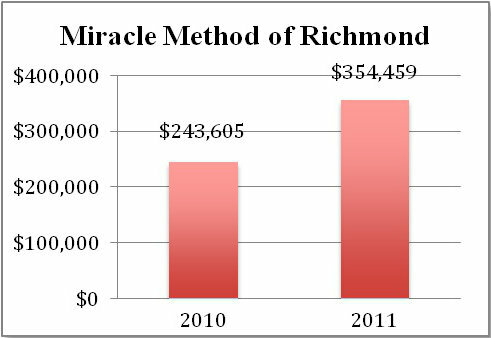 Today, the amount of marketing and technical support that Miracle Method provides is invaluable. We feel we have the business model and market growth potential to help us continue growing our business,” Leo says. Leo and Emily have seen great success over the past few years, even in the recent economic crisis. In fact, their franchise recorded its second consecutive million dollar year in 2011 and Leo and Emily see no limits ahead. “When other businesses were complaining about the economy, we continued to grow. With Miracle Method’s technical, marketing and administrative support you can grow your business faster, with more profit, and stay well ahead of the competition. This business model works!” Leo added. If you are ready to take control of your own future, visit the Miracle Method website today to learn more about our franchise opportunities. We will give you all of the support you need to establish a successful business. Is all refinishing the same? What makes it different? 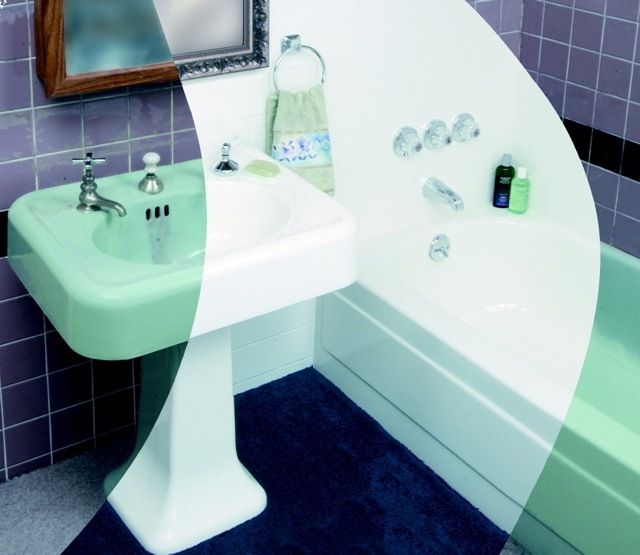 Surface refinishing is a proven and cost effective alternative to the removal and replacement of kitchen counters, bathroom vanities, bathtubs, and tile. But if you think all surface refinishing is the same, think again. There are several factors that make Miracle Method’s surface refinishing stand out against the competition, and today we’re going to tell you about why our refinished surfaces stand is superior to the competition. First, only Miracle Method has MM-4, a proprietary bonding agent that is acid-free. It bonds the old and new surfaces together on a molecular level to ensure quality and durability. Others may say they use similar materials, but they’re not as good nor have they been proven for over 30 years! Secondly, our refinished surfaces not only look like new, they feel like new, too. We take extra care to detail the new surface – a step above what most refinishers are willing to do. We also offer superior service and craftsmanship. Miracle Method surface refinishers are highly trained and only use the best materials and procedures to ensure the best results and a job done right the first time. We’ll explain the process thoroughly, complete the job on time, and won’t have any hidden charges or surprises. Best of all our work is guaranteed for five years against failure of adhesion of the new surface. After two years this Natural Accents refinished countertop still looks like new! 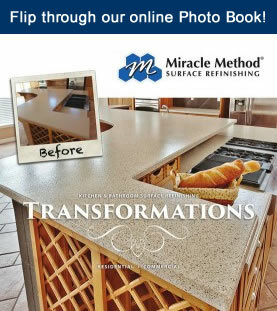 If you’re planning to have some of the surfaces in your home refinished, choose to do so with Miracle Method. We have been “The Preferred Refinisher” for over 30 years and have over 120 franchises across the nation. Visit our website for more information. To find the franchise closest to you, call 855-212-7337 or use our online locator. Like many other Americans, David Dowdy has experienced the loss of a job. He worked as a senior corporate buyer for Circuit City until it closed its doors in 2009. His wife, Elizabeth, taught customer service at a nearby college, and after David lost his job, they decided to look into the opportunity of owning their own business. The overall franchisee satisfaction with the level of support received from the corporate office. The need in the community for the product and its ability to thrive in a time of economic recession. The national staff was genuinely dedicated to its franchisees. If you’re ready to own your own business, we invite you to visit the Miracle Method website to franchise ownership. We will be there for you every step of the way, just as we have been for the Dowdys and all of our other franchise owners. Call us today at 800-444-8827 to request info and get started.